There are lots of tempting reasons to consider making Ireland your new home. In this report I’ll explain everything you need to help you get a passport to this wonderful place. World citizenship up for grabs! It’s 8:30pm on a Saturday night and you’re driving back home. You get to the house and you realise you forgot to lock the door! But it doesn’t really bother you because break-ins are virtually non-existent here. You grab a warm coat and leave the house to meet a few friends at a local pub a few blocks away. As a South African living with the constant threat of violent crime, this may seem like little more than a daydream. But for a few South Africans, it’s a reality! And, the comfort of knowing they’re safe wherever they go isn’t the only benefit they’re enjoying. They also have unrestricted, visa-free access to no less than 169 countries. They have expanded legal rights, globally. They have access to a whole new world of wealth-creating opportunities. And, best of all, they have reduced taxes and increased protection of their assets. They have an Irish passport. You see, since the 2008 recession Ireland’s growth has been at a virtual standstill and their government is looking for innovative ways to revive the once vibrant economy. What this means for you is that as you can simply buy Irish citizenship if you can help contribute to their economy. I’ll explain how in detail in a minute. And, if you qualify for citizenship through ancestry, it’s even easier! So Why Should You Listen To Gavin? Gavin Fourie, who wrote Ireland: Your Gateway to Europe is the most qualified person when it comes to living a millionaire lifestyle anywhere in the world - period. After getting his economics and econometrics degree and starting several successful businesses, many of which he’s still involved with to today, Gavin went on to become a well-respected investment strategist and Forex trader. You may have seen Gavin on Good Morning Africa, or heard him appear as an expert trading and investment guest on South African business radio stations such as Chai FM. Today though, when he’s not sailing around the Cape peninsula or relaxing on the beach in sunny Miami Florida, Gavin’s best known for his work as the editor for the popular South African investment and lifestyle newsletter, Unconventional Millionaire. Through this publication, Gavin teaches his readers how to make, save and grow their money and live the millionaire lifestyle for less. Gavin has truly been around the global block. And while he still believes South Africa is one of the best countries of the world...The sad, yet undeniable facts are that the South African way of life has continually gotten worse over the past 50 years. And the pace of decline is only accelerating. So Gavin wrote Ireland: Your Gateway to Europe to help people just like you create more options for living and getting back control of your life. After all, your life belongs to you. Gavin will reveal everything you need to know to get your second essential passport in the invaluable guide, Ireland: Your Gateway to Europe. 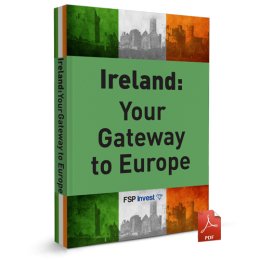 You can read, use and apply the secrets contained in Ireland: Your Gateway to Europe for a full 30 days and if you’re not completely satisfied that this guide will help you get your Irish passport easily, simply return it to us for a full refund – no questions asked. Gain access to the valuable, potentially life-saving information available in this resource for the amazing once-off price of just R197.00. There’s never been a better time to invest in Irish property! You see, right now the property prices in Ireland are at an all-time low. Seriously, the prices are ridiculous! You can get a two-bedroom townhouse for just 500,000 euros. Or a one bedroom apartment for just 50,000 euros. Whether you’re just looking for a beautiful home for you and your family or want to make money from rentals, the Irish property market is filled with gems. And you’ll find everything you need to know to get started in this lucrative market in the report Buying Irish Real Estate,which you’ll get absolutely free. We don’t like to think about it, but what if South Africa does become the next Zimbabwe? What if taxes keep escalating without end? What if the violent crime only gets worse? Don’t you and your family deserve a plan B? Get your copy here today. PS. Get your Irish passport and be 100% sure your family, your wealth and you are safe. 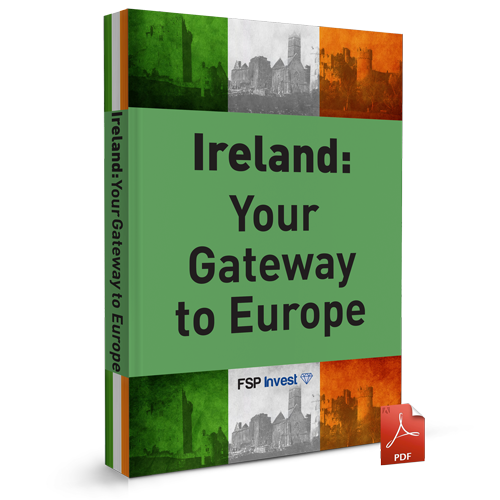 Get your copy of Ireland: Your Gateway to Europe today. Second passports aren’t just for tax-avoiders and outlaws on the run. They’re for people like you and me looking for a way to secure our rights and increase our wealth. A second passport cuts out a lot of red tape and governmental meddling. Some countries, as you probably know, will not permit entry to travellers whose passports have been stamped by "unfavourable" countries. For example, many Arab countries will not allow visitors who have been to Israel. And many South Africans would hesitate to have to show a local passport while traveling in the Israel right now. With a second passport you can establish private offshore bank accounts and make overseas investments that aren't available to South African Citizens. Many banks and investment firms in foreign countries simply won’t deal with South African customers because of our Government restrictions. Who wouldn’t like to retire to a secluded beachfront property, complete with a live in maid, for less than the cost of a modest 2-bedroom townhouse complex house in a crowded Johannesburg suburb? A second passport can help you reduce your taxes. Of course, a second passport does not automatically cut your taxes. There's more to it. Establishing citizenship in a tax-free haven, for example, is one step you can take. To do this, you'll need a second passport. For me, it's nice to keep these options open, especially when I get ready to retire. Get your second passport today! "What an informative report! Now, I'm a proud owner of an Ireland passport and it didn’t even cost me much get hold it. Thanks to this book."